Prison to Prison, an Intimate Story between two Architectures is the title of the Uruguay participation in the 16th International Architecture Exhibition – La Biennale di Venezia. Addressing the Freespace theme in the notoriously confined space of two prisons. The beauty of the 16th International Architecture Exhibition - La Biennale di Venezia is discovering the many variations on the very general theme selected by the two curators, Yvonne Farrell and Shelley McNamara, Freespace. We saw many, interesting examples there, including the poetic emptiness of the Indonesia Pavilion (link) and the re-appropriation of the Freespace in the death strip of Berlin in the Germany Pavilion (link). The concept of Freespace is largely political and offers a unique opportunity to raise urgent issues in a context - the Biennale - where architecture becomes a driver of social and cultural debate. 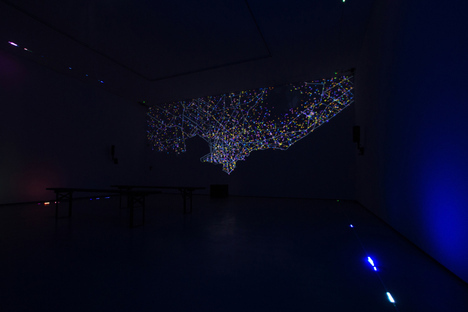 True to the tradition that in 2016, in response to Reporting from the Front, had unveiled a hole in the floor of the pavilion, as a reference to the history of the country and the movement of the Tupamaros (link REBOOT), once again the curators of the Uruguay Pavilion, Sergio Aldama, Federico Colom, Diego Morera, Jimena Ríos and Mauricio Wood went with a strong and interesting theme. With Prison to Prison, an Intimate Story between two Architectures, they explore two similar and yet very different places, addressing the existence of an unprecedented Freespace in two types of prisons in Uruguay. They are both located in Punta de Rieles, a barrio, or district, in Montevideo, almost joining each other, but these two prisons couldn't be more different from each other if they tried. The first, a kind of village jail, was built in 2014, a state-of-the-art detention centre. Indeed, the prison director, Luis Parodi, who was an exile in France during the dictatorship, explains, “For over a century, we have been witnessing the failure of prison policy. It's time to try something new.” The former high school teacher goes on to say that “...prisoners can only learn dignity if they are treated with dignity.” And the prison should be as much like the outside world as possible. This is the best way to rehabilitate and reduce the rate of relapses, which in the case of prisoners who served their time here has actually halved. A model that has been closely studied and copied abroad as well. The concept of this prison is a flourishing, vibrant district that imitates the outside world inside it, creating an unexpected Freespace for collective projects and activities inside a detention centre. Despite the excellent results achieved with this detention model, in 2017 it was decided to build a new structure with a very different approach to prisoners, focusing on punishment and surveillance. The new prison replicates an abstract model imported from abroad, American style, which was implemented under the guidance of a private construction company. Conversely, the “village jail” was built on the foundation of existing constructions and other structures built by the prisoners themselves, almost without any input from architects and academics. It's interesting to note, however, that neither of the two prisons was designed by Uruguayan architects. In this context, Prison to Prison, an Intimate Story between two Architectures proposes research focused on the juxtaposition of these two realities, with the aim of opening up other dialogues that go beyond the subjects of study. A perfect excuse to reconnect to architecture and its generous and necessary cultural dimension, as well as to secure unexpected empowerment, which is just what the curators of the 16th International Architecture Exhibition - La Biennale di Venezia were hoping for.